Fun start to a series! 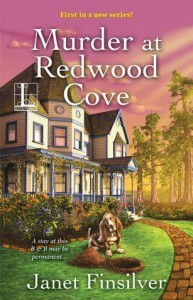 Kelly Jackson hates that she is taking over for a dead man, but her company has sent her to run the Redwood Cove Bed & Breakfast. Not long after she gets there she gets wrapped up in what happened to Bob, the man who died. The Silver Sentinels, a group of older individuals who fancy themselves and crime solvers is on the case and fill her in on how they think he was murdered. Before she knows her curiosity has gotten the better of her and she starts looking into Bob’s last days. Then one of the kids of an employee is almost harmed and she starts thinking they are some how related but what would Tommy have seen to have someone try and kill him. Now she is really on the hunt because she adores Tommy and nobody should want to harm a kid. Finally after what happen to Tommy the local police start taking what she and the Silver Sentinels have to say about Bob being murder and they soon find out the reason. Now they just have to try and decipher some clues to figure out who it is. I really like Kelly, she is a blackbelt in taekwondo and even though her parents would rather her be working with them she is determined to make it on her own. She has been cheated on so she is slow to warm up to men, but she is kind of crushing on a co-worker from her company. I really love the Silver Sentinels, they are so adorable. They are the protectors of the town and I thought it was so sweet how they took turns watching out for Tommy. Just a great cast of characters. It has a great mystery too because I really didn’t figure it being who it was and I like it when I don’t figure it out. This is a great one for all cozy lovers!